A man looks into CBGB's shortly before it closed in October 2006. Where do you think punk goes to die? Surprisingly, it's not some dive bar in the sky, but rather it's "crated into boxes and shipped off to a mini-storage unit in the industrial wastes of Brooklyn", reports the New York Times in a great piece called "The Tomb of CBGB". They sent a photographer out to see what was left of the legendary nightclub, which was forced out of its lease in October 2006. 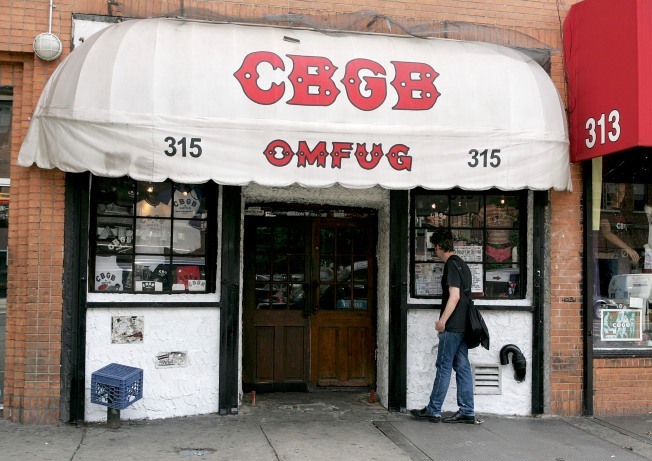 From the multimedia photographs that came out of that visit, it's sad to see that what remains is basically a clothing warehouse for iconic CBGB gear, or as the son-in-law of the deceased owner Hilly Kristal said, "a regular old boring office job." Far from their days as New York's baddest venue, they "now make business calls for CBGB Fashions, a clothing operation run from the storage unit that sells T-shirts, belt buckles, onesies for kids, even a CBGB dog vest for your poodle." And yes, that's right, your poodle can wear CBGB gear, that little punk. FREEwilliamsburg adds, "Apparently, any pride or nostalgia the employees may have once felt has now been replaced with desk job tedium. Still, who can blame 'em? If you were selling these nifty guitar pick earrings, you'd probably detach yourself from the entire thing as well." Maybe it's time to sift through the boxes of beer seen in the multimedia presentation and compile some kind of final book - featuring the set lists, love notes, and phone numbers left over from years of CBGB debauchery, and call it a day. Sometimes it's better to let things die, than create some Frankenbeast of Rock and Roll, suffering quietly away in some storage basement in Brooklyn.